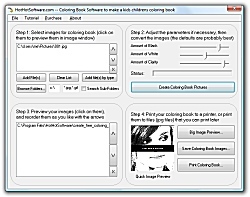 Coloring Book Software to make a kids childrens coloring book Software! Get it now! Only $29.95 U.S. (Regular $49.95 US!) for a limited time! 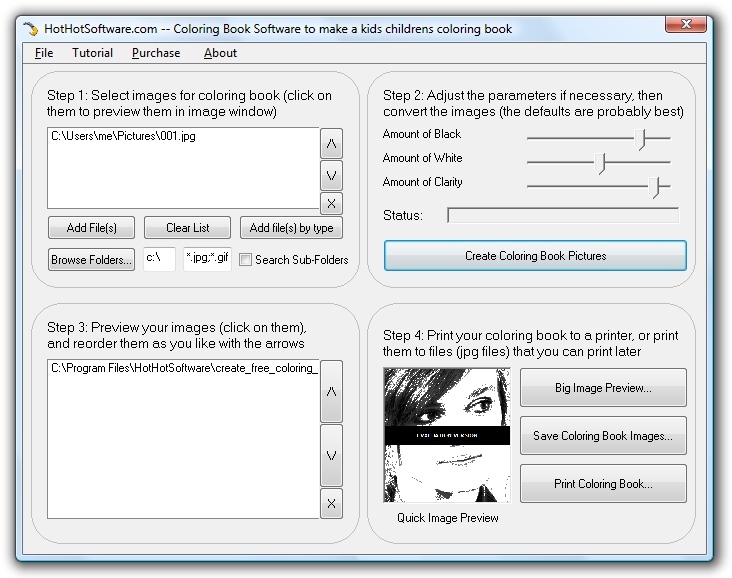 Simply use the software to "scan" in the images that you want converte into a coloring book. You can use pretty much any type of image, you can use pictures of horses, houses, dinosaurars, bible study, christmas coloring books, barbie coloring books, pokemon and so forth! Afterwards, you can preview each of the pages that you created with the coloring book software, and then organize what order the pages should be in. You can then print off the coloring books, and give them to your own children as a surprise, use them as birthday gifts, use them for PTA/JK/school activities/coloring books, plus much more! You can even create your own coloring books as images, and then sell your creation over the internet! Start making your own custom coloring books now! You can order by credit card, Phone/Fax, Mail, PayPal or purchase orders! Purchase it now! Only $29.95 U.S. for a limited time! Click above for a larger screenshot! Click here to read testimonials! Win online sweepstakes! Click for more details...!